Incredible investment opportunity to own a rare large lot in the prestigious neighborhood of Oak Bay. 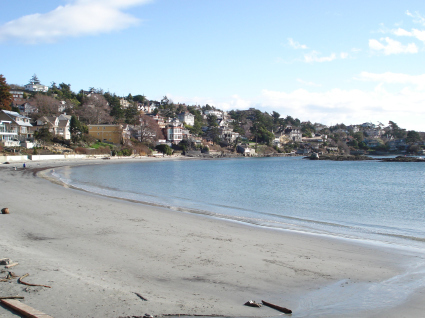 Currently, this is the only VIEW lot available in the Oak Bay area. Seller has stunning plans available for you or create your own dream home. With lot dimensions of 80' x 133' the maximum buildable floor area is 4,521 sq. ft. Located across the road from Gonzales Beach...which I like to call 'Victoria's Malibu'... Views to the Southwest of the Olympic Mountains to Washington State. Walk to some of the best private and public schools. Bus route to UVIC just around the corner. Join the Victoria Golf Club which also has ocean views... actually the course is waterfront and just a few minutes drive from this property. Now once the weather warms up, you'll be enjoying your breakfasts outside on the patio. At night. With a view of the skyline. Unless you're facing the other way. Pick some mood music and contemplate something while moon and stargazing. This unique property is surrounded by fine homes and I have a fine custom home builder standing by to help build this home or answer any questions you may have. GST is not applicable. Please call Brenda direct at 250.744.4556 or email brenda@brendarussell.ca if you would like help with real estate in Victoria and Oak Bay and please stay tuned for more updates.